A war in low-cost computers could be in the making as a new $15 board computer that could challenge Raspberry Pi 3 finally ships. 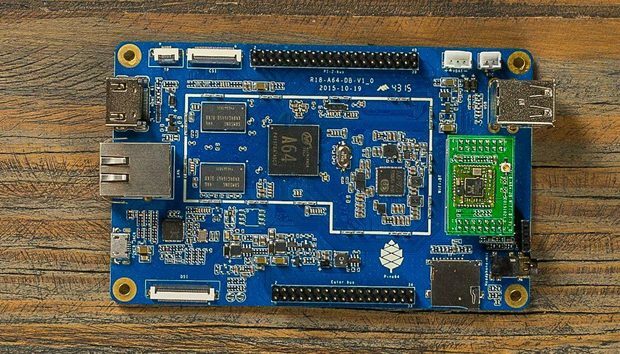 On paper, the Pine 64 is as powerful as the $35 Raspberry Pi 3. It can be a PC replacement, and the most expensive model, with Wi-Fi, is priced at $29. The initial shipments are going to backers that poured a total of US$1.7 million into a Kickstarter campaign to develop the computer. Pine64, the computer's maker, is shipping out small batches after delays and slowly ramping up production, according to posts in the company's forums and on its Kickstarter page. There are three models of Pine 64 listed on the company's Web site. The cheapest, $15 model is out-of-stock, but the $19 and $29 models, which can be pre-ordered, will ship no later than May, according to the site. The Pine 64 is similar to Raspberry Pi 3 in many respects. It has a 64-bit ARM-based Cortex A53 CPU, MicroSD slot, Ethernet and HDMI ports. But Pine 64 has better graphics, with an ARM Mali 400 MP2 graphics processor capable of rendering 4K video -- the Pi 3 is capable of 1080p video at 60 frames per second. The Pine 64 has two USB ports, while the Raspberry Pi 3 has four USB ports. The base $15 Pine 64 model has 512MB DDR3 RAM, while the $19 model has 1GB of DDR3 RAM, a 5-megapixel camera port and MIPI video port. The $29 model has 2GB of RAM and also Wi-Fi, which is also a key selling point for Raspberry Pi.